Saint Euphemia the Great Martyr (Feast Day - September 16 and July 11). 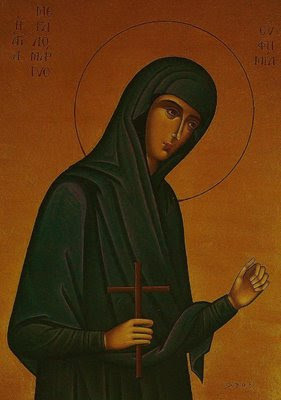 Elder Paisios directed the nuns of Saint John the Theologian Monastery in Souroti to depict St. Euphemia in this way (see icon above) as he saw her in his vision. Note: I was notified today (09/16/09) from a friend that in Constantinople, during today's Divine Liturgy for the Feast of St Euphemia in the Patriarchal Cathedral of St George at the Phanar, "the fragrance from her holy relics filled the Church." Saint Euphemia was from Chalcedon and lived a life of virginity for the sake of Christ. According to some, she suffered martyrdom during the reign of Diocletian in 303; according to others in 307. July 11th we commemorate the great miracle of St. Euphemia which she performed during the Fourth Ecumenical Synod when she confirmed the Orthodox Faith for the Fathers through her sacred relics. Her sacred relics are preserved today in the Patriarchate in Constantinople. "St. Euphemia, you who miraculously solved the serious problem the Church was facing then, take the Church out of the present impasse!" "It is me, Euphemia, Father." There was a third knock and the Elder felt someone coming inside his cell and walking through the corridor. He went to the door and there he saw St. Euphemia, who had miraculously entered his cell through the locked door, and she venerated the icon of the Holy Trinity, which the Elder had placed on the wall of his corridor, on the right hand side of the church’s door. Then the Elder told the Saint: "Say, Glory to the Father and the Son and the Holy Spirit." St. Euphemia clearly repeated those words and immediately Father Paisios knelt and venerated the Saint. Afterwards, they sat and talked for quite a while; he could not specify for how long, as he had lost all sense of time while being with St. Euphemia. She gave the solution for all three matters he had been praying for and in the end he said to her: "I would like you to tell me how you endured your martyrdom." The Saint replied: "Father, if I knew back then how eternal life would be and the heavenly beauty the souls enjoy by being next to God, I honestly would have asked for my martyrdom to last forever, as it was absolutely nothing compared to the gifts of the grace of God!" Towards the end of June, the doctors informed Elder Paisios that he had about 2-3 weeks left to live. On Monday, July 11, on St. Euphemia’s feastday, Father Paisios received Holy Communion for the last time, kneeling in front of his bed. During the last 24 hours, he was very serene, and even though he suffered, he did not complain at all. He did not wish to take any more medication. The only medicine he accepted was cortisone, because, according to the doctors, it would not prolong his life span, but it would only give him some strength. 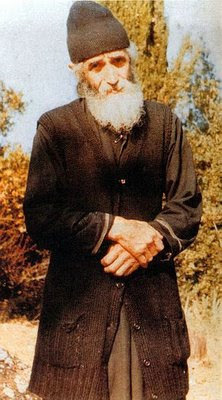 On Tuesday, July 12, Elder Paisios humbly and peacefully rendered his soul to God, whom he had deeply loved and served since his early childhood. Thou strovest valiantly in thy sacred contest; and even after death, thou makest us holy with streams of healings, O all-famed Euphemia. For this cause we venerate thy most holy dormition and with faith we stand before thine all-venerable relics, that we be freed from illness of the soul and also draw forth the grace of thy miracles.